Team leaders meet in Syracuse, NY for the annual PGCBL fall meeting. SYRACUSE, N.Y.- The Perfect Game Collegiate Baseball League held its Annual Fall Meeting in the first weekend of October in Syracuse, New York. 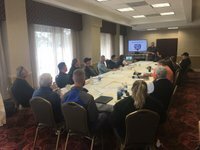 The two-day event saw representatives from each PGCBL franchise meet to discuss the future of the league, as well as strategies for the growth of the league and its individual teams. Saturday's docket took on more of a workshop feel, as the day began with a discussion led by league Director of Umpires Rob Healey. Following the umpiring discussion, the league representatives participated in a discussion on marketing and promotions, led by former Minor League Baseball Executive of the Year Dave Oster. Oster spent 15 years as the General Manager and then the President of the Lake Elsinore Storm, one of the most recognizable franchises in Minor League Baseball. He also spent time with the Geneva Cubs, Wilmington Blue Rocks, and Salem Avalanche, was named by Baseball America as the Minor League Baseball Executive of the Year in 2015. Oster's talk focused on marketing, promotions, sales, and the business side of baseball. On the second day, league business was discussed among the team representatives. Among the items discussed at the meeting were the 2019 league schedule, as well as the divisional format and playoff structure. At the meeting, it was determined that the 2019 season will begin on May 31, 2019, and the regular season will conclude on July 30. During that time, PGCBL teams will play 48 games to determine which seven teams qualify for the playoffs. The league's divisional structure of East, Central, and West will remain in effect. As was the case last season, seven teams will qualify for the playoffs. The top two teams in each division will play in the postseason, as will the third place team in the division where the team with the best record resides. Other announcements pertaining to the 2019 season, including news on the 2019 PGCBL All-Star Game and the official unveiling of the 2019 schedule, will be announced in the coming weeks and months. Dutchmen VP & GM, Jason Brinkman, reflects after Day 1 of the weekend meeting.